This morning, I dived deep into my collection of ancient recipe books, looking for the kind of snack ideas that no book published after 1975 would dare include. After choosing my “subjects,” it was time to gather the ingredients. Good God, I spent a fortune. 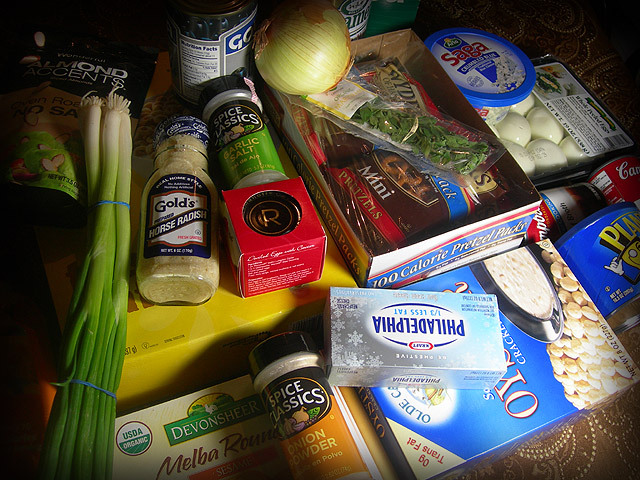 I’m not sure what happened, since I specifically chose recipes that seemed not only easy, but cheap. Oh well. 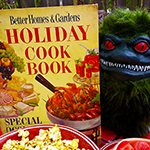 Christmas only comes once a year, and it’s not like I ever pay attention to these old recipe books when it’s not Christmastime. If I was gonna blow a hundred bucks on cream cheese and bootleg caviar, I picked the right day. Below are four of my creations, based on recipes from Better Homes & Gardens’ 1963 classic, Snacks and Refreshments. 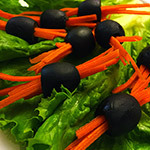 May they bring you good tidings, and inspire you to do wacky things with black olives. 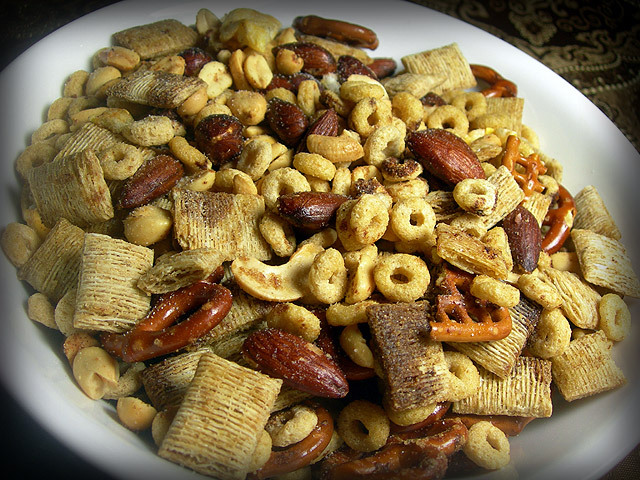 What I like about Scramble is that it’s Chex Mix without the Chex. I’ve done the Christmas Chex Mix thing to death, and it was time for something new. New, but not THAT new, because homemade Chex Mix is freakin’ great. Scramble is just that: A scramble. You could modify the ingredients in a thousand ways, but I stuck with Better Homes & Gardens’ suggestions. This is Cheerios, mini shredded wheat, mixed nuts, two kinds of pretzels, demolished rice cakes, and enough garlic salt to recreate Vilanculos Beach right in my own kitchen. Basically, you take all of that, douse it with oil and Worcestershire sauce, and bake it at 250 degrees for like, three hours. Or at 375 degrees for 30 minutes, which is what someone does when he or she doesn’t want to turn “a blog about Scramble” into an all-day event. It’s dangerously good. The kind of thing that you must seal in a can and hide away, because there is no way to be in the presence of any amount of Scramble and not keep devouring it until there’s none left. 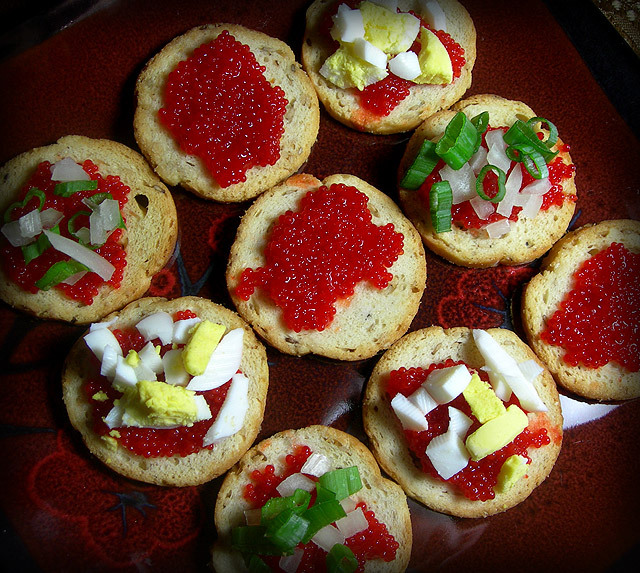 For me, no Christmas is complete without one of those small jars of red lumpfish caviar. If it isn’t the cheapest caviar available, it’s close. 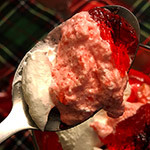 Given that supermarkets see no issue with leaving it out at room temperature for months on end, it’s more like a jar of gooey salt that once, long ago, may have actually been fish eggs. 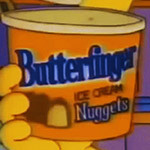 I’d liken its flavor and mouthfeel to impossibly soft salt rocks with bubbles inside. Pictured are a few methods of turning that caviar into low-rent canapés, using Melba toast for the bases. In one version, you just smear a little caviar on. In the second, you top the caviar with diced egg. In the third, minced chives and onion are added instead. They’re all delicious. The chive/onion/caviar combo was probably my favorite, both for its visual impact and because chives always make me feel fancy for some reason. I would absolutely make these again. 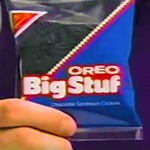 In fact, I’m thinking about making a batch for our big Christmas Eve party. Nobody will eat it, so it is fortuitous that I am just lazy enough to be totally assured, even as I sit here now, that I won’t actually go through with making another batch. I know it doesn’t look like much, but this one was special for me. As the world’s last defender of tomato juice, I welcome any and every opportunity to turn it into something more. I thought I’d already plowed through all of the weird tomato juice cocktails from my old recipe books, but nope, there was Toddy. Hi, Toddy. 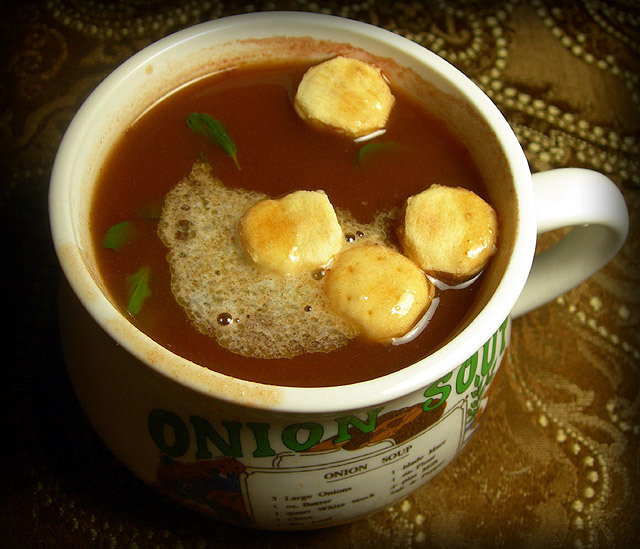 Admittedly, this is more of a “soup” than a “cocktail.” It’s equal parts beef broth, tomato soup and water, boiled and blended with marjoram and just enough butter to make it totally unhealthy. The best part was their suggestion to add oyster crackers, because I never remember to buy those tasty bastards unless some old recipe book tells me to. The result is a tomato soup that’s more meaty than tangy, with the exact amount of richness required to make eating it the last thing you do before napping. You kinda need to just be a sloth after drinking a Tomato Toddy. On what’s probably going to be the last “easy” night before the Mad Christmas Rush, that’s perfect. Do me in, Tomato Toddy. Bloat my ambitions to the door. This is terrific. 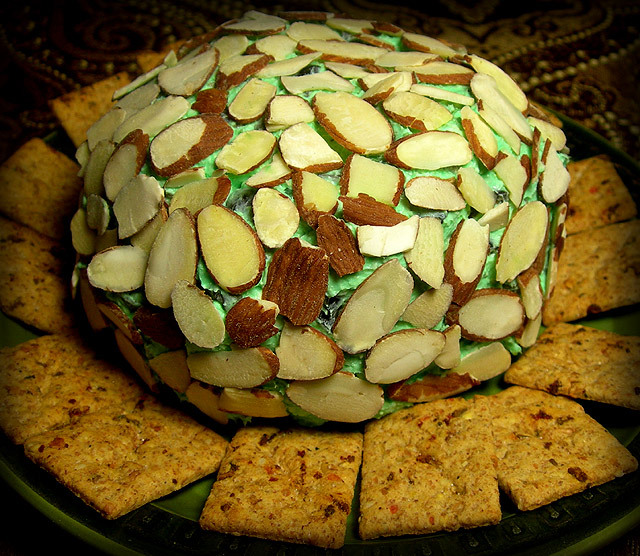 It’s a ball of cream cheese, blue cheese, butter and diced ripe olives, covered with sliced almonds. It looks like the brain of an extreme space alien. Many places sell smaller, premade olive-cheese balls at this time of year, but they will never compare to one you make yourself. I put my heart and soul into this thing. I must have spent an hour carefully placing the almond slivers, so that no length of exposed cheese dared to exceed a centimeter. This was a labor of love, and if I had any germs at all, anyone who eats this will soon have them too. Giant cheese balls do not make themselves. You gotta be okay with getting your hands dirty. If you’re wondering how I got “green cheese” out of cream cheese and blue cheese, I added some Easter egg dye. I think it helps. Plus, I got to dye cheese. Don’t act like it doesn’t sound fun. Overall: There is nothing above that I wouldn’t recommend trying. Keep in mind, I’m pretty good about giving myself failing grades when I deserve them, so if I’m telling you that they’re good, they really are good. Now get to the mound, little buddy. Go make yourself an alien brain. Ancient Holiday Appetizers, Part 5! 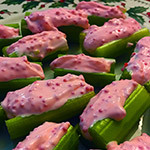 Ancient Holiday Appetizers, Part 6!